Fighters Only’s 3rd annual World Mixed Martial Arts Awards took place Wednesday night. This year’s winners were announced at a fancy black-tie reception at The Pearl inside the Palms Casino Resort in Las Vegas, Nevada. UFC Hall of Famer Randy Couture and Versus hottie Molly Qerim hosted the star-studded event, which debuts December 9th on Versus. 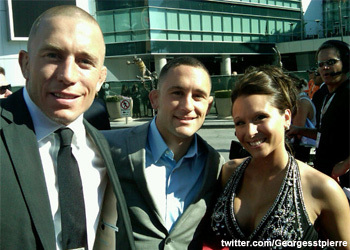 The ceremony was devised to celebrate the special successes and achievements made within the MMA industry. It provided fanatics across the globe the chance to vote on which athletes, brands, and industry professionals have made the greatest impact on the sport over the last 12 months. Voting took place across 19 different categories including Fighter of the Year, Knockout of the Year, and Best Lifestyle Apparel.